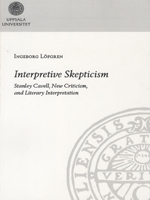 This dissertation explores and analyzes interpretive skepticism in literary theory. It argues that traditional interpretive theories and debates often harbor unacknowledged forms of skeptical thinking and arguments. As these forms of skepticism are seldom recognized as skepticism, the problem tends to remain hidden and unresolved. The dissertation further argues that interpretive skepticism is (i) the result of a philosophical confusion, and (ii) practically harmful when used in order to regulate interpretive practice. Accordingly, a central purpose of the dissertation is to offer an analysis and taxonomy of what interpretive skepticism is. Only once we are in a position to understand and recognize it in its many guises will we be able to criticize and challenge it. The dissertation concludes with a chapter that leaves the confines of the New Critical idiom to explore interpretive skepticism within the tradition of so-called “hermeneutics of suspicion.” Through readings of Susan Sontag, Eve Kosofsky Sedgwick, and Cora Diamond, it argues that suspicious or paranoid hermeneutics is not skeptical in itself but can become so through the skeptical temptations of dogmatism, authoritarianism, and fraudulence.